Matt Cox Tuesday, October 25th! Prime Rib – October 7th & 21st! In October our Prime Rib dates will be Friday, October 7th & Friday, October 21st! It’s hard to believe, but October 1st will be the 2-Year Anniversary of us purchasing The Emerald Isle! We would like to invite you to celebrate with us with $2 Beer and Drink Specials! 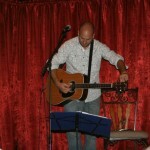 Benji Green will also be playing music for us this evening after dinner! 1/2 Way to St. Patrick’s Day! The Bar only will open at 11 AM on Sunday, September 4th and Monday, September 5th. The kitchen will be closed all day both days. Closing time will depend on crowd – if in doubt call ahead! Thank You and have a Safe and Happy Labor Day Weekend!